I was reading Cookiecrumb's foodblog, and she was starting in on an Eat Locally Challenge for a week. She decided to keep her budget under $72/person while looking for foods that were grown or raised within 100 miles from her home. $72/person is the Bureau of Labor Statitics average statistic on how much people spend on food per week while eating at home, when there are 2 wage earners. With one wage earner it is about $68/person. This challenge seemed liked it was going to be a bit of work for Cookie, but she does have the access to local and organic foods from the Bay Area, Marin County, and the wine region to the north. How did it turn out for Cookie and Cranky? Well, they ended up spending only $35 per person, with an occassional guest in the house. Cranky said it was so much easier to eat in the food parymid while eating locally, which is a healthy plus. These spending averages should be fairly easy to follow for a household of 2 wage earners. I actually think that eating-in is a bit high, and alcoholic beverages is a bit low in a non-dry county. When I first read what Cookiecrumb was doing, I thought I just could not do that where I live because we have basically only chain grocery stores and Walmart, which gets their stock from the cheapest parts of the world. How was I going to find locally grown foods for my table? Then I just took a trip out through central and east Tennessee, and all I saw were free range livestock, goats, cows, and horse, and lots of farmland. With all this farmland within 100 miles of my home, why is it so hard for me to find locally grown foods? I did a little research about finding locally raised meats, and this is what I found out. According to the National Agricultural Statistics Service of the USDA report released Feb. 2007, in the year 2006, Tennessee was one of the top 10 cattle producers in the USA. If that is the case, I am interested in finding a way to buy some of the locally grown free range beef for my table, and not that generic Colorado slaughter house meat. I also went to the Earthday Celebration in the Park, and met 3 local and organic farmers who participate in consumer supported agriculture. These and a few other, I believe, are banding together and starting a booth at the Nashville "Farmer's Market" for 4 hours, 9am-1pm, on Saturday mornings. The "Farmer's Market" has sadly never been a real farmer's market, rather it has been a bunch of vendors selling 2nds and "after market" fruits and veggies that exceeded their shelf lives at the chain grocery stores. I am pleased to hear that real farmers are making a small start to take back the "Farmer's Market" in downtown Nashville. So, since I met the farmers at earthday, and read Cookiecrumb's entries of eating locally, I have decided I will play along too. I have been spending all my free time trying to figure out where I can get local milk, butter, cheese, and grains. I believe I found milk, the butter and cheese may be difficult, and I am nervous I will not find any grains. Cookie and Cranky made some exemptions to their food list and I think I will too. 1 Try to stay in the budget for 2 people, $152 for in-house food, $134 for outside dining, and $20 for alcohol. 2 Try to only obtain foods raised within 100 miles from the center of Nashville. 1 salt and water, as Cookiecrumb said, these are necessary for life, and should not be restricted. I drink filtered tap water, so I know the source is my local river. 2 coffee and tea, as history has shown that these were worthy for trading with kings and queens, and I am no good in the morning without my fair trade, locally roasted coffee. Everything else should be locally grown or raised, that means milk, fats and oils, liquor, wine, meats, fruits and veggies are from local growers. 2 any other restaurant which strives for local foods, do you know of any? What do I want to get out of this challenge? 1 Find sources of locally grown and raised foods to buy from all year round. I want to eat more locally grown foods, but have it obtainable for my hectic lifestyle. 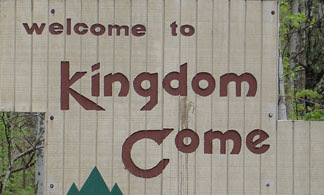 If I have to drive to Kingdom Come and back, it won't be sustainable for me. 2 Get decent local eggs from healthy chickens. I plan on starting on the next Sunday. I am positive I can find all sorts of great treats to eat that are produced right here in my area! I went to my local international market to see what I could find. The original K&S market down on Nolensville Rd isn't tidy, in USA grocery store standards, but it doesn't seem to matter to the shoppers who go there. This market includes many common ingredients used in most Asian, Mediterranean, and South American nations. This market is packed every Saturday with people who look like they represent ever corner of this earth. It is refreshing to me to feel like Nashville does have an international presence, and the culinary landscape of Nashville is expanding to include, not only Southern traditional cooking, but international flavors of the world. The ancient wars over spice trading makes more sense to me now, when my yearning for excellent international flavors, tastes and food grows, and access to these things are still difficult in my town. My last trip to K&S was to find Spanish olive oil to cook with, and to see what I can see. I stopped in the produce isles and decided I was going to make a fruit salad with fruits I have not used before. Was this going to be a mistake, or a gold mine? Well, this is what I bought. I do not know how to pick these fruit, so I just jumped in with a little hope that I picked good ones, and put them in my basket. They are really pretty aren't they? I got home and sliced open these fruit, and this is what I saw. I definitely had to shift plans with the Kiwano Horn Fruit. 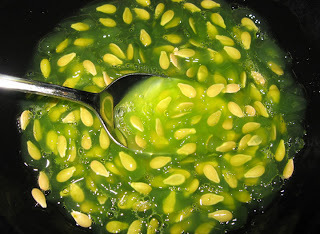 I was thinking it would be like a little kiwi or cantelope inside, and what I got was a green slimy seed covering with the texture of soup jello before it is chilled, and little seeds that remind me of the white seeds of an immature or seedless watermelon. The scent was green like a grassy cucumber, and the flavor of the green slime was like a very intense cucumber. The Kiwano was definitely announcing its presence as a high liquid content fruit/veggie, but I just did not feel like it was appropriate for my fruit salad. The Ya Li pear was a small white pear with a less intense sweetness than the bosc. 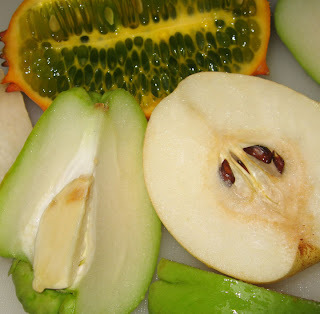 The texture is smoother than a bosc, and it is somewhere in between an apple and pear. This fruit was a winner for my fruit salad, and I diced it up. The fruit salad became a can of diced pineapple, the diced Ya Li and the diced Chayote. I left out the Kiwano green slime, although it might have added a nice springtime fresh scent to the salad, but I did not like the texture of the seeds. I could have put the seeds and green slime in a blender, but I am lazy, and that would be another item to clean up later. The pineapple and Ya Li were very good. 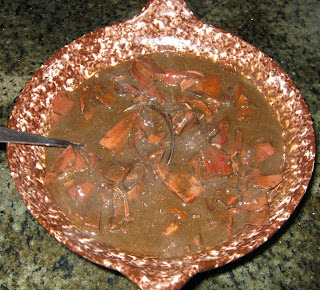 The Chayote, in its denseness, did not absorb any of the pineapple juice, and remained hard and bland as ever. 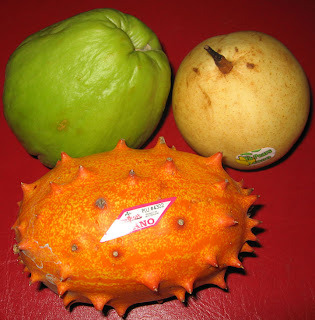 I am surprised that the acid in the pineapple juice did nothing to breakdown the Chayote at all. The fruit salad was not a big success. Oh well. The Chayote, I think would be better cooked. There is a winter melon soup popular in Chinese restaurants in New York, where there is a light broth and diced up comfort food winter melon in it. On a small scale, the Chayote maybe a good substitute for the winter melon, but I do not believe that Chayote would lend much flavor to the soup. I am betting that the Chayote is better cooked than raw because I think cooking would open up the flesh to absorbing the surrounding flavors like a potato would. That is it, I am on to my next food adventure. 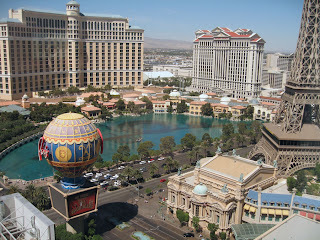 Here are some things that I saw in Las Vegas. 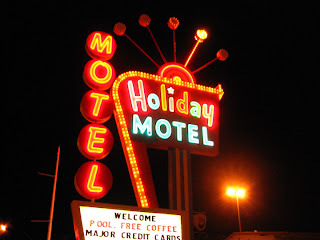 A Holiday Motel, not an Inn, but has the same shape sign as the original Holiday Inn. 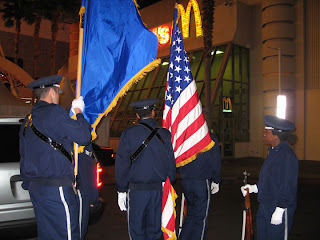 The Colorguard getting ready to present the flag at a local awards ceremony. Do I really have to write a line about this colorful fellow? Do I have to write a line about this colorful woman? 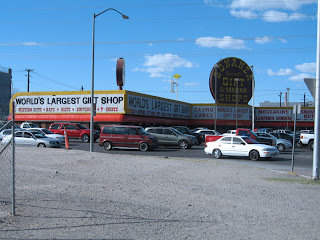 The world's largest gift shop? Maybe. Who knew there could be so much junk made in China and then shipped so far to be sold for $10 or less? 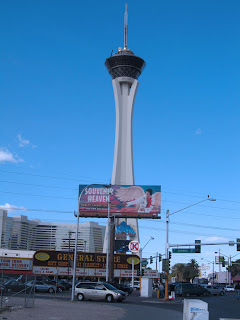 The Stratosphere, once the tallest amazing tower that looked down on the old Las Vegas Strip. Now, it is just another tower needle that is dwarfed by the mega-hotels down on the lower Strip. Some photos of our trip to the old downtown Las Veags - Freemont St. It is alive and well, and exactly what you would want in Oldtown Las Vegas. There are a lot of junk shops, carts selling junk, and casino's with buffet and steak dinner deals. The largest TV in the world is the ceiling of the Freemont St Arcade. After moving away from Los Angeles, LAX, where the HK's spent a lot of time before TSA shut down access to the gates except for travelers, I forgot all about the HKs. 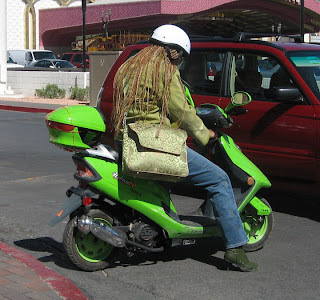 I wonder what they were doing on the Las Vegas old strip? They were not chanting, they were not handing out flowers, they were not doing anything. Do you think they were secretly wanting to gamble, drink alcohol and get their baby a new pair of shoes? The Cowboy. He is now under the cover of the largest TV, and no longer outside. Golden Nugget. Who has to keep up with all the lightbulbs? 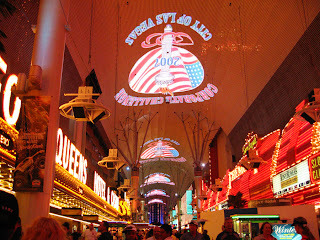 We spent time in the old part of glitzy Las Vegas. 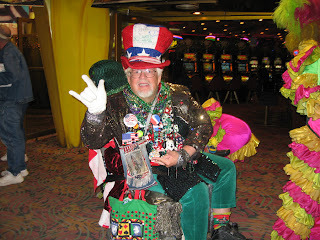 With the Stardust demolished to dust, where were we going to eat to be totally "old school" Las Vegas? Well, we found the Golden Nugget, one of the oldies but goodies. When I was about to walk into the place, I was expecting to see the Golden Nugget Hotel and Casino decorated in the era of the Rat Pack, but with 50 years of wear. I was expecting a worn-out ratty carpet, buzzing fluorescent lights, old worn out felt on the gaming tables, many broken slot machines, cigarette burn marks on everything, and leathery faced employees who have seen better days. To my surprise, I found a modern, clean, and exciting hotel and casino that would appeal to most anyone who was looking for a Las Vegas vacation. 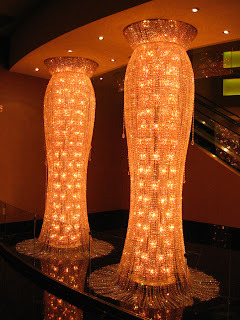 The Golden Nugget was not completely over the top and expansive like the modern lower strip hotels and casinos, but it was large enough to have a little for everyone. We ate at the Golden Nugget buffet and had a view of the pool. 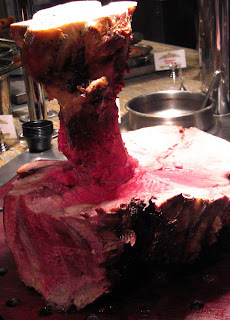 One option at the buffet was roast beast. On the other side of the room was the dessert counter. 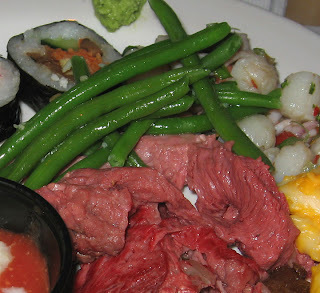 I opted for some of the roast beast, green beans and sushi. There was a sushi guy rolling some sushi, but 1/2 way through my roll, I asked him for just salmon sashimi. He looked at me, a bit annoyed, and then plopped a few slices of salmon on my plate. Because this was my 2nd buffet outing, I really had to step back from the dessert table and pick wisely. 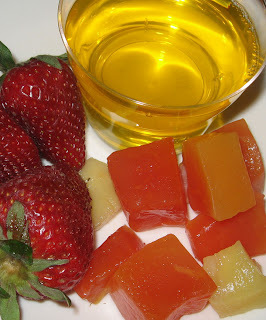 I opted for fruit and jell-o. The berries and jell-o were good. The papaya was not as ripe as I would hoped. Well, I and my dinner mates pigged out again, so we had to walk it off. To my surprise, we made to down to the pool area. It was really cool! It is a small pool, in Las Vegas terms, and it is located in the center courtyard of the Golden Nugget. There are pool chairs in the shallow part of the pool, so sunbathers can stay cool in the water, but be above water for sipping on a tropical drink. 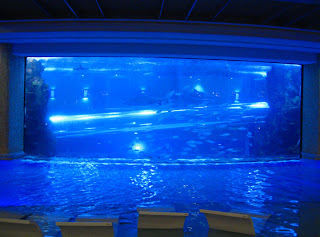 The coolest part of the pool is the giant aquarium in the middle of it. I think that the water slide goes right through the aquarium, for fishy fun. I really liked going to the Golden Nugget because it is still standing as one of the original and famous casinos in Las Vegas. I like the history of the place back to the days of when gambling, booze and alcohol were "racy". It has not torn-down and mega-rebuild like so many others, rather it has updated the insides. It is like updating the counter tops in your kitchen without changing the structure of the kitchen. 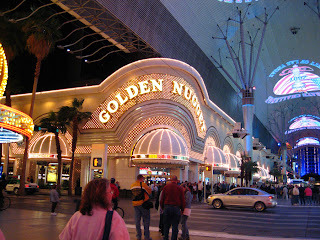 I keep hoping that the Golden Nugget continues on holding down the tradition of the old Las Vegas Strip! 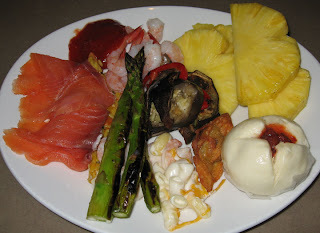 The Aladdin Hotel and Casino has a buffet that was voted #1 buffet in Las Vegas by the Las Vegas Review Journal. Not the tourist, not media, but a poll of Las Vegas residents who read the Review Journal. As a matter of fact, there were local Las Vegas people in front of us in line, who always bring out of town guests to this buffet, to show off the best Buffet in Las Vegas. I would have to agree with the poll because there was a great variety of food, 8 stations that represent 8 regions of the world, the food was fresh, the recipes were tasty, and the restaurant was roomy. As everyone knows, I love food, but the older I get, the less calories I need to eat to maintain my weight. 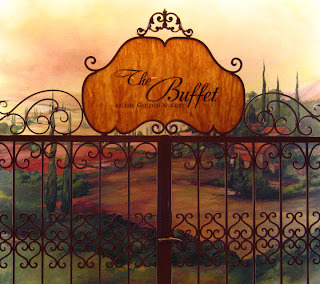 Heading into the #1 buffet in Las Vegas was a little scary for me, thinking that I would dive into heart-unhealthy, fat ladened food. To the contrary, I ate very healthy here! There were lush fresh fruit to choose from. 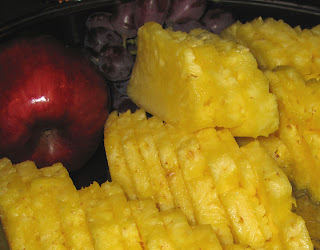 I love pineapple, and here is what the pineapple looked like. It was ripe, juicy and sweet. I loaded that on my plate! 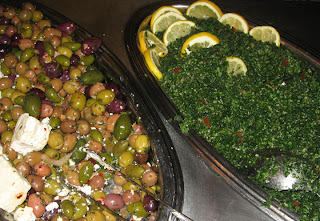 At the Mediterranean station, there were olives, feta, taboulli, babaganoush, hummus, fresh grilled lamb and chicken, and other yummies. There was a fish station with bake sole with spinach, shrimp, mixed seafood stir-fry, sushi rolls, and smoked salmon. There was an Asian station with select dim sum, teriyaki, and fried rice. There was a Mid and South American station with fresh salsas, salads, tortillas and taco ingredients. There was the European station with pasta, ravioli and grilled veggies. Of course there was the American-USA station with mac & cheese, and other stuff, but I got stopped by the mac & cheese because I love mac & cheese. Here is my plate. I feel it was fairly healthy with smoked salmon, a couple shrimp, grilled asparagus and eggplant, one tiny scoop of white cheddar mac & cheese, pineapple and a Chinese pork bun. Everything was really good, except the pork bun, which I did not eat. 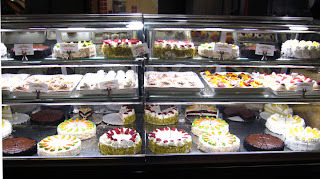 Then, there was the dessert case. I hate wasting food, so I debated on whether to eat dessert or not. Well, I decided to take one bite and be happy with that. I opted for a chocolate cheesecake, and here it is. It was REALLY GOOD! Yes, I only had one bite that I really enjoyed a lot. 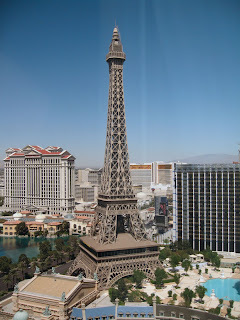 The next morning, I was kicking myself because I was in Las Vegas, I might as well have indulged because it is Las Vegas, the "Land of Excess". I should have eaten the whole piece of cheesecake. I should have! The next day, I opted to eat dessert to try to make up for not eating the delicious chocolate cheesecake. All the 2nd place had was chocolate cake in the chocolate department, s I ate the cake. It was not the same as the creamy dense goodness of the chocolate cheesecake, and I actually do not like cake that much. So here I am, still thinking about the delicious chocolate cheesecake I had at the Aladdin Hotel and Casino Buffet. Take my advise people, if you go there, and they have chocolate cheesecake, and you like chocolate cheesecake, JUST EAT IT! It is very tasty good! 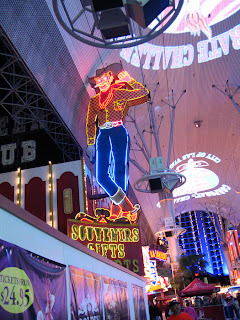 Is it possible to eat on the Las Vegas Strip for cheap? Rachel Ray eat your heart out! Yes indeed, it is possible to find a meal with a drink under $5 inlcluding tax and tip. Yes, you read that right. Here it is. One of my friends and I woke early enough, and took a 65 minute walk around the block. You have to understand, that blocks on the strip are about 1 mile square, or about 4 miles around the block. We passed by "Slots A Fun", not Slots o' Fun, or Lots of Fun, but "Slots A Fun". The allure of the slot machines that take pennies and nickels, and food counters saying pizza, subs and hotdogs were too much for us to pass up! We shuffled back to the hotel, collected the others, and walked back to Slots A Fun for our lunchtime meal. We were not sport fans, but we felt welcomed into Slots A Fun for some fun there! 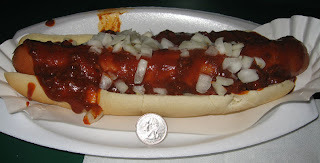 I immediately queued up to the hotdog line, $0.99 per 1/2 lb hotdog, and add $0.50 for a laddle of chili on top. Onions, pickles and relish were free. That would be $1.49 for my meal! And, the best part about it, at the bar, there were $1.50 margaritas. How can you pass up a lunch for under $3 on the Strip? Here is my lunch in all its glory! A 1/2 lb hotdog smothered in chili and sprinkle of onion. All that for less than $1.50! Amazing! I got a really early start on my trip to Las Vegas. I got to the airport early, my plane was on time, and I got into Las Vegas by 10:30 am. There was about a 1/2 hour time delay with the airport shuttle, the driver forgot to give luggage to riders who got off at an earlier stop, and we had to double back in traffic to find the luggage-less people. I finally settle into my hotel, and I look for a magazine for places to get lunch. The hotel book says, "Ask the concierge." I travel down to the front desk, and I ask where I might be able to get some good Japanese sushi or really good Chinese, as Nashville is lacking in quality in these two foods. The concierge said, "Oh, the best place is P. F. Changs! You can take the trolley bus to get there!" OK, no tip for the concierge because P. F. Changs is not that good, and is a freakin' chain that is Chinese food answer to O'Charley's trying to an Irish Pub. Disgusted, I walked outside to wait for this trolley bus that runs every 10 min. and that everyone talked about. 1/2 hour later, I found myself walking to the closest monorail stop. Finally at about 1 pm, I was finally on the move away from the hotel to lunch. I took the monorail to the Flamingo, and crossed the street to the newly built Ceaser's. The Ceaser's has the biggest mall with Jimmy Choo's shoes, a casino with penny slots, a bunch of restaurants to choose from. The one that caught my eye was Hyakumi off the Ceaser's conference center and casino floor. Hyakumi is not listed in any of the fliers or where to eat tourist books that I picked up along my walk, so I would have never found it if I just did not start walking around the strip. The concept of this restaurant is 1/2 Japanese and 1/2 Chinese food. They had Japanese sushi, tempura and udon, and they had Chinese roasted pork, roasted duck, fried rice and noodles. The best part was that the dishes were not too terribly expensive either. There were quite a few Asian people eating at Hyakumi's. I suspect that they were all yearning for a little home cooking fo noodles, and rice after eating all sorts of other foods during their trip to Las Vegas. Perhaps they all had hopes like me for getting a little Asian soul food before departing the Ceaser's hotel and conference center. So, I opted for a few pieces of sushi and a noodle soup bowl. 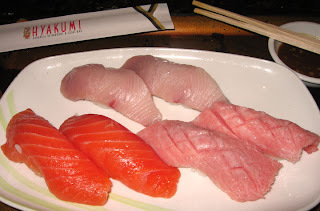 The sushi I opted for were my favorites of yellowtail and salmon, and I also got fatty tuna belly toro. I cannot get toro anywhere in Nashville, nor anywhere for 200 mile radius. If I could, I would not trust eating it anyway. Hyakumi's toro was very rich and buttery. The toro was possibly the best toro I have had in over 25 years, and I am not exaggerating. The toro standard is the memory of toro I had in Boston in the 1980s at one of the first sushi and finest bars in Boston. At that time, we would go fairly often, and the chefs got to know us and give us the best trimmed pieces of fish. Ceaser's Hyakumi's toro tuna was just that good. 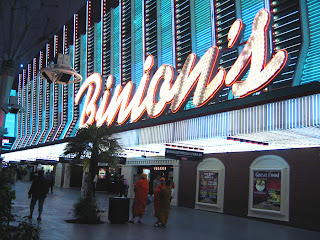 When I go back to Las Vegas, this little restaurant is on my list to visit again, so I hope it is there! 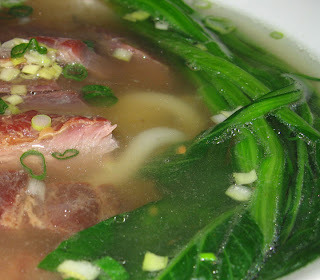 The bowl of soup I ordered was supposed to be thin Chinese wheat noodles with baby bok choy and sliced roasted red pork. I asked for them to make my soup with white udon because it is my favorite noodle for soup, and Hyakumi's was glad to do that. They parked the giant bowl in front of me, and I was in heaven! The bowl looked like a bowl of soup you would be able to get in a New York Chinatown noodle soup shop (except I asked for udon). I heard a couple other diners around me say, "Oh, that big bowl of soup looks awesome!" It was. I cannot find red roasted pork in Nashville anywhere, and my failure to be able to cook it in my own home has been sad for me. I was happy and pleased to be able to eat it as my first meal on my Las Vegas vacation! So, I rushed home from Las Vegas because I won a seat at a Tapas Dinner. Way back in October, I went to a 1/2 silent and 1/2 live auction for a good cause, and I won a seat to this wonderful Tapas Dinner. This dinner was offered last year, at the same auction, but I did not get to go to the auction because I had twisted an ankle running the Race for the Cure earlier that day, and I had my ankle bandaged, on ice, and elevated. It was too painful to go anywhere, and I was crushed. The year before last, I was out of town, and unable to attend. So, for two years in a row, I heard my friends, who attended and won seats at fabulous dinners, talk about the hosts, the food, the wine, and great company! They were just gushing over the culinary talent of the hosts. Finally, this year was my year, I WON A SEAT at the TAPAS DINNER. 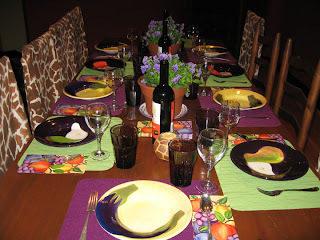 The table was set with lovely colors. 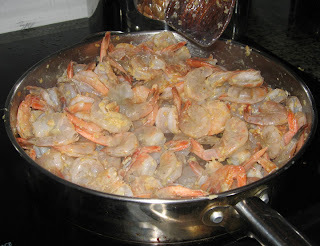 On the menu was shrimp with garlic sauce. There had to be a full bulb (not clove but BULB) of garlic that was crushed and put into this dish. How could you not love this simple and yummy dish? 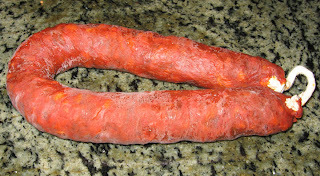 Here is Spanish Chorizo. This is different from the raw Mexican Chorizo sausage. Spanish Chorizo is made in a similar tradition as salami, and sopressata, a dried aged meat that is preserved and able to store at room temperature. As you can see this Chorizo has a rope on it, as it could hang from a nail in the wall until it is time to eat it. 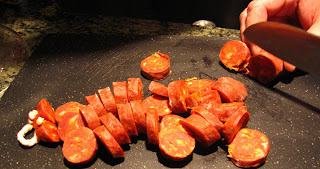 Spanish Chorizo usually has smoky paprika in it, and that is what gives the lovely red color and flavor to the sausage. Our host cut up the Chorizo and stir fried it. It was very good on top of a slice of French bread. We had a cold gazpacho soup made with diced ingredients. 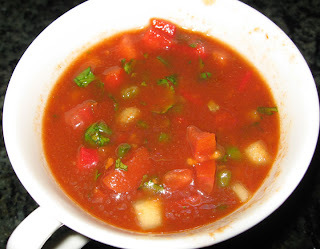 The host told us that gazpacho is considered Mexican, but has become very popular in Spain. 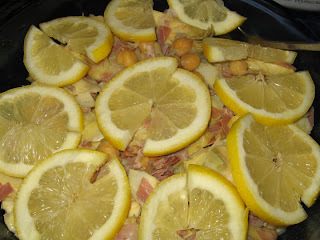 This cold salad dish includes chickpeas, artichokes, and ham. The traditional way to make this dish is with Serrano ham, which is a salt cured ham that is air dried for at least a year at elevation in Spain. Because Serrano ham is nearly impossible to get in Nashville, our host substituted prosciutto, an Italian air dried ham. This omlette looking thing is a room temperature omlette with potato in the middle. 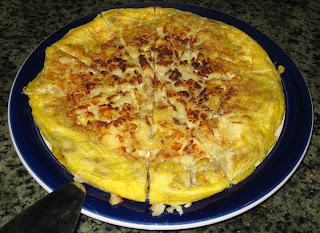 This dish is called a tortilla - Spanish omelette. This dish is a roasted potato dish with a tomato, garlic and paprika sauce. 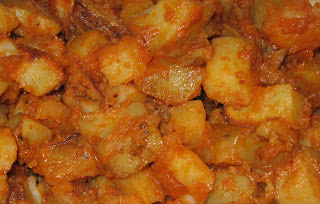 The host roasted cubes of potatoes, and had the tomato paprika sauce stewing on the stove. When the potatoes were ready to plate, the host poured the sauce on the potatoes and gave them a little stir, and voila! This dish was really good! The host used sweet paprika instead of Smoked Spanish Paprika. I may try to make this creamy and rich dish at home with Smoked Spanish Paprika to add that special something that we don't normally get in the USA. My favorite dish of the evening, yet for some reason I had very little competition to eat it, was the squid cooked in a squid ink sauce. The photo did not do this dish justice. It was much more richly brown and charcoal grey in color. It was like the color of a lovely good chocolate. Rice was served with this dish, and I just helped myself. The flavor was quite earthy, with a bit of a mushroomy flavor. It was delicious, and do I dare say umami? I would say it was umami because the flavor was that special something that I could not get enough of, kind of like truffles. I have had a different recipe with squid ink once in a Chinese restaurant in Los Angeles, and I recall really enjoying it too. 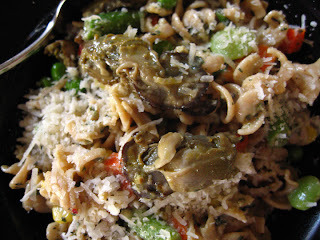 I think that anyone who likes earthy and strongly flavored mushrooms would enjoy this dish. How would one end a Spanish Tapas dinner? 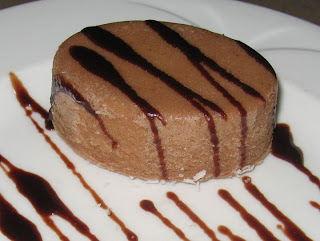 With Flan of course. 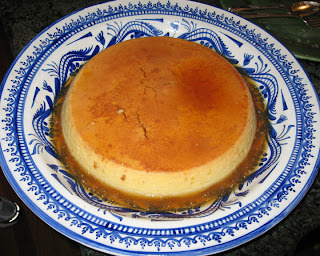 Here is the video of how one would un-pan the flan. Watch, and go AH! As I got ready for a little trip to Las Vegas with some other girlfriends (what happens in Vegas, stays in Vegas), I did not want to buy any parishables before I left. I was desparate for a meal, so I was stuck having to rumage through my cupboards for something. This is what I came up with. 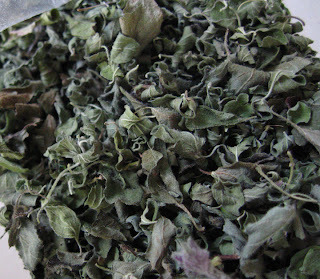 I have quite a bit of dried oregano that I harvested from my plants from last year. Once I took down the baggie of oregano, I knew it was going to be some Italian inspired dish. What else? Oh, I spied a tin of smoked mussels! Oh, I love the flavor of these little treats! These mussels went into the pile of of ingredients to make my meal. In the same cupboard, I found some curly whole wheat pasta, so that went into the pile too. In my fridge, what did I see? I saw an egg, frozen veggies (lima beans, peas, carrots, and corn), and a wedge of Parmigiano-Reggiano. I definitely wanted to use those, and I decided that a Carbonara was in my future. I cooked up the pasta, and at the last minute, I dumped in the frozen veggies to be cooked. I drained the pasta, and then added the crushed red chili, oregano, garlic granules, and raw egg into the pasta then stirred and stirred, then covered for a minute for the egg to cook from the heat of the pasta and for the dried herbs to develop their flavor. 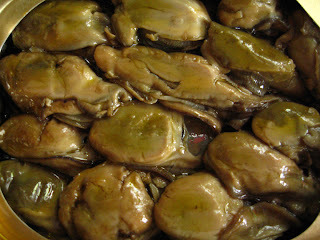 I few minutes later, I folded in the drained mussels from the tin. Then I topped it off with some of my prized Parmigiano-Reggiano. Ta da! My desparation meal a day before leaving for vacation. I did have a jar of marinated artichoke hearts that probably would have been good too, but it never made it into the pile on the counter. The meal was good for the purpose of not buying more parishables that would go to waste while I was gone. I am trying to cook with low sodium, and this dish could have had a little more salt.